The INSPIRE Implementing Rules on interoperability of spatial data sets and services and the data specification guidance documents are based on the UML data models developed by the INSPIRE Thematic Working Groups. These data models are managed in a common UML repository, which also stores older revisions of the models. This page makes different revisions of the INSPIRE UML models available in different formats and views (see below). Each of these revisions corresponds to a specific set of (draft or approved) Data Specification Technical Guidance (TG) documents and/or Implementing Rules. 4618 This version corresponds to the content of the Implementing Rules (EU) No 1089/2010, No 102/2011, No 1253/2013 and the latest publicly available version of the data specifications of Annex I, II+III. This distribution contains only those data models that are contained in the amendment to the Implementing Rules for Annex II+III themes, including the updates of the Annex I data themes. This distribution combines the data models contained in the amendment to the Implementing Rules (see above) and the extended data models contained in the data specification Technical Guidelines (but not in the IRs).Please note that the extended data models not included in the IRs should be considered as draft and therefore be used with caution. Informative overview of the spatial object types and data types defined in the INSPIRE data specifications, which provides an easy entry point to the INSPIRE data models and data specifications for implementers and decision makers. An interactive HTML view of the complete UML data models. This view includes detailed definitions of spatial object types, data types, enumerations and code lists and UML class diagrams. Zip archive containing the INSPIRE UML models as an EA project file and XMI exports. These can be used by developers for importing the INSPIRE data models in Enterprise Architect (EA) (or other UML modeling tools). 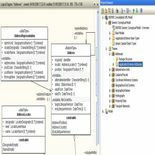 Alternatively, developers using EA can link to the INSPIRE UML models using one of the public branches in the svn repository (https://inspire-twg.jrc.ec.europa.eu/svn/inspire-model/branches/public/). 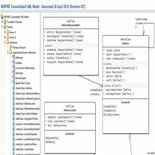 Before connecting, please read the instructions for how to connect to the repositories from EA and download the UML profile used in the INSPIRE data specification development. 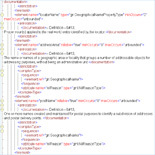 The GML application schemas (xml schema documents) and code list dictionaries generated from the UML application schemas based on the default encoding rule (see Guidelines for the Encoding of Spatial Data, D2.7). 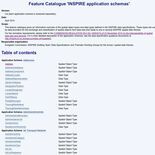 The GML application schemas are also available through the INSPIRE schema repository at http://inspire.ec.europa.eu/schemas/ (Approved schemas) or http://inspire.ec.europa.eu/draft-schemas/(Draft schemas).